If you haven’t seen the billboards, heard the radio ads or read all the news surrounding the National Folk Festival coming to Salisbury this weekend, well — you probably haven’t been anywhere near the Delmarva peninsula. Tens of thousands of people are expected in Salisbury this weekend for the big event that celebrates folk culture and tradition in all its forms, both regionally and from all around the United States, and if you aren’t sure yet what to expect… Here’s a rundown of the National Folk Festival in Salisbury, by the numbers. In the modern age, nothing better represents a region’s culture than its local craft beer. Evolution Craft Brewing is a Salisbury staple, and their famous Lot 3 IPA will be on tap through the weekend. Besides Lot 3, there will also be brews available from Guinness: While one might not associate the traditional Irish brewery with Maryland just yet, their newest Brewery & Barrel House just opened this August in Baltimore, where they brew small-batch beers that employees have the freedom to create themselves. 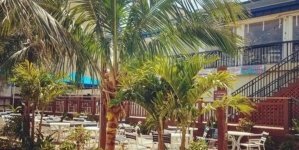 Mango White Tea will also be available from Ocean City favorite Hoop Tea, in addition to Bud Light, Stella Artois, Cape Cod Cranberry Spiked Seltzer and non-alcoholic soft drinks, fruit drinks and smoothies. The exclusive wine provider of the festival is Layton’s Chance, a vineyard and winery based out of Vienna, Md. Lot 35: Fitzwater St. & W. Main St. Lot 7: Lemmon Hill Ln. Lot 13: W. Chestnut St. Lot 10: E. Church St. & Poplar Hill Ave. Lot 5: E. Main St. Downtown Parking Garage: E. Market St. The Folk Festival is a big draw for families who come to teach their kids about local heritage and all the different cultures nationwide, but it’s’ also a place where kids can let loose and have fun — specifically in the festival’s designated Family Area. 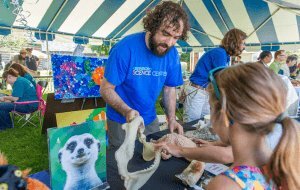 Performers will tell stories and lead interactive music and dance on the Family Stage, and beneath the stage will be all kinds of games, dances, crafts, a collaborative community art project, a bee hive exhibit, animals from the Salisbury Zoo and even an opportunity to learn about the Underground Railroad. Plus, again, crafts. Educational crafts. Make & Take activities in the Family Area include a rainstick, a make-your-own harmonica, a colonial “whirligig” toy, a traditional yarn doll, a carved-soap duck decoy, a Gyotaku fish printing and paper quilt squares. 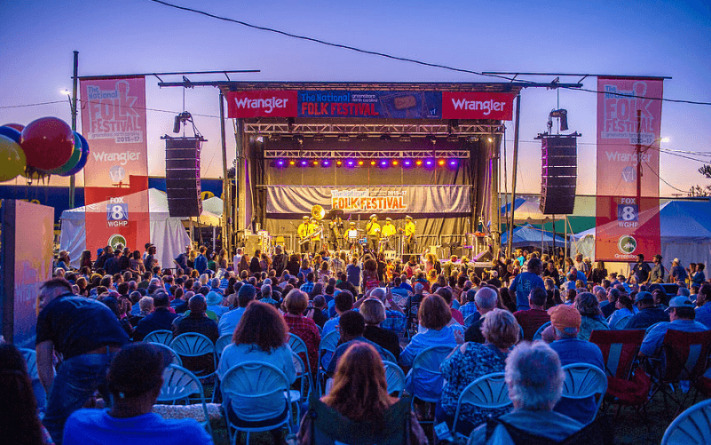 It is the National Folk Festival, but in every city that hosts the event there’s a pretty big emphasis on that region’s local culture and folk traditions. 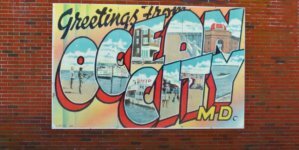 Maryland is a state that’s rich in its diversity of culture and tradition, and at least 10 stage performers will be demonstrating that through music, dancing and storytelling. From Baltimore, Shodekeh & Ian Hesford will demonstrate Tuvan throat singing, and Mama Linda Goss & Dr. David Fakunle demonstrate a longheld tradition of African American storytelling. Two bluegrass duos hail from Elkton, Rising Sun and California, Md. respectively; Swedish fiddlers come from Brentwood, while Cambodian homrong musicians will travel from Gaithersburg and Takoma Park, Korean samulnori musicians travel from Kensington and Laurel, and Persian classical signers come from Potomac and Rockville; The Phil Wiggins Blues House Party hails from Takoma Park; The Sensational Royal Lights gospel quartet come from Catonsville; and Singing & Praying Bands bring their devotional music from all over Maryland and Delaware. The Folklife Demonstrators, much like the performers, exemplify major aspects of Maryland life and culture — but, unlike the performers, these demonstrators are largely from Delmarva and will show festival-goers aspects of food, art, agriculture and maritime tradition that are unique to the Chesapeake. For years upon years, the hearty and resourceful people of the Eastern Shore have shucked oysters, picked crabs, carved decoys, painted screens, made scrapple and delicious Smith Island Cakes — the list goes on and on. People can see these rich Chesapeake traditions in action and enjoy their byproducts over the festival weekend. In the marketplace, festival-goers can take home their own little piece of folk culture from Maryland and Delmarva. Wares range from hand-blown glass made right at Salisbury University to woodwork to pottery to handmade quilted handbags. Delmarva natives can add a new trinket to their collection that was made practically in their backyard, while visitors from farther away can bring home a souvenir that will always remind them of the Eastern Shore. 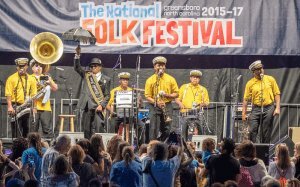 The “national” aspect of the Folk Festival really comes into play on the many stages that line downtown Salisbury, hosting performers from all over the United States who represent different cultures and artistic styles from across the world. Some of the 27+ national performers include “Mr. Telecaster” himself. rockabilly guitarist Albert Lee, in addition to The Bing Brothers string band from West Virginia,the Chankas of Peru, who come from Port Chester, Ny but perform ancient dance rituals straight from the Andes mountains, Clinton Fearon and the the Boogie Brown Band reggae getup, a puppeteer from North Carolina who works strictly with recycled materials called Jeghetto, and many, many more. That’s almost eight decades, and in fact, the 80th year of the Folk Festival will be celebrated in Salisbury, too. Each city hosts the Folk Fest for three years, so 2018 is only year one for Salisbury (which means if you aren’t able to make it this year, you don’t have to be too distressed). For the last three years, the festival has been held in Greensboro, North Carolina, and the first one ever, for just one year, was held in St. Louis, MO in 1934. It takes literally hundreds of people to make the wheels turn and to ensure that everything functions properly in such a major event. It might be a little late yet to volunteer for the 2018 season, but surely more hands will be needed in the years to come. Estimates of attendance for the festival’s first year in Sby have ranged from 60 to 100,00 people. 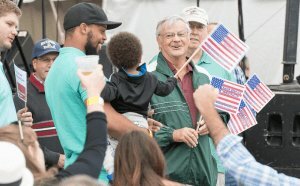 In Greensboro, the festival’s first year’s attendance landed in the 102,000 range, which increased to about 138,000 people in 2016. Needless to say, it will be tricky getting around Salisbury now and throughout the upcoming weekend. Many roads are already closed off, and Route 50 at Mill Street is expected to be one of the more congested areas. Delmarva Now details the road closures and projected problem areas, and also has a few tips for getting around during the event.